A storm has moved in and is taunting me with rain just out of reach. Some lightening just hit nearby and sent a power surge through my RV. Not good for the electronics. It took a while for the air conditioner to get back to full power. At least the modem came back on. I forgot that this happens every year. Anyway, at the beginning of this month I spent $93 on groceries including an assortment of fruits and vegetables. That was a very bad idea. So far 2 grapefruit have gone bad, one tomato expired, one yellow squash went mushy, and one entire head of broccoli turned brown. Very bad indeed. I bought them all with the best of intentions but lost track of time and forgot them. 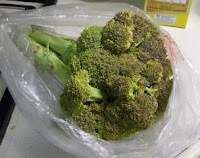 I had planned to cut up, cook and freeze the broccoli. I thought that buying it fresh would be much better than buying the store brand frozen kind because the quality was very bad. It would have been better to buy the premium broccoli instead. I would have paid a little more but at least I would have broccoli to eat! The grapefruit must have been over-ripe already because citrus usually lasts for weeks in my fridge. Oh well, lesson learned. Next month I will save some money for the middle of the month and replenish my fruits and vegetables so that there is less chance of them going bad. I do still have apples, oranges and mandarins for the rest of the month. I am aggressively attacking the lettuce so that it doesn't turn slimy and brown. Throwing out rotten food is like throwing money in to the desert but I'll do better next time. Know what you mean on the bargain brand frozen broccoli. Some things aren't really a bargain. Someone told me you could make lettuce last longer by wrapping it in paper towels, and then putting it in a ziplock bag. I haven't tried it yet though. It's like chewing on tree branches. I saw Emeril peel the stem and I wanted to try it. Maybe later. I suppose that would keep the slimy down to a minimum. Keeping it longer than 2 weeks is just overly optimistic I think. ... there are way less people who eat broccoli. Consider investing in some surge arrester devices for the most sensitive electronics. Costs much less than repairs. Hello KoBold, I wrote a whole post today to answer you. The jist of it was...I'm in denial.